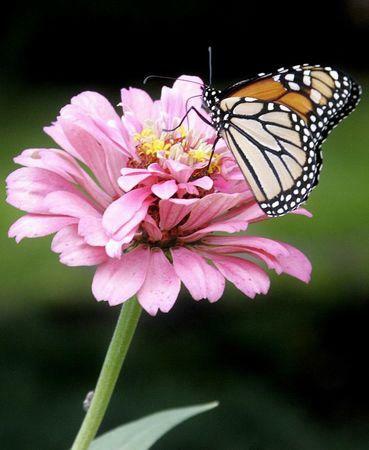 (Reuters) - Monarch butterflies may warrant U.S. Endangered Species Act protection because of farm-related habitat loss blamed for sharp declines in cross-country migrations of the orange-and-black insects, the U.S. Fish and Wildlife Service said on Monday. Monarch populations are estimated to have fallen by as much as 90 percent during the past two decades because of destruction of milkweed plants they depend on to lay their eggs and nourish hatching larvae, according to the Xerces Society for Invertebrate Conservation. The loss of the plant is tied to factors such as increased cultivation of crops genetically engineered to withstand herbicides that kill native vegetation, including milkweed, the conservation group says. Monarchs, unique among butterflies for the regularity and breadth of their annual migration, are also threatened by widespread pesticide use and logging of mountain forests in central Mexico and coastal California where some of them winter, said biologist Karen Oberhauser at the University of Minnesota. The agency's initial review will take about a year to complete. The butterflies, revered for their delicate beauty after emerging from a jade green chrysalis ornamented by gold stitching, are roughly divided into two populations in the United States according to their fall migration patterns. Monarchs from east of the Continental Divide wing across 3,000 miles to Mexico, while those from west of the Divide in Rocky Mountain states like Idaho make a relatively shorter journey to California. 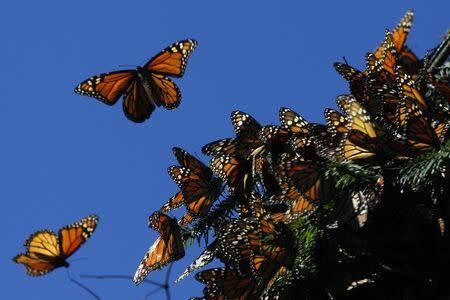 An estimated 1 billion monarchs migrated to Mexico in 1996 compared with just 35 million last year, according to Marcus Kronforst, a University of Chicago ecologist who has studied monarchs. Monarch populations are tracked by an extensive network of professional and citizen scientists who make up part of the butterfly’s vast and loyal following. “Almost every person I’ve talked to about monarchs has expressed a deep love and admiration for them that was often formed in childhood,” said Beth Waterbury, regional wildlife biologist for the Idaho Department of Fish and Game. The monarchs' navigation remains mysterious. While they are known to orient themselves by the sun's position, and by the Earth's magnetic field on cloudy days, it is unclear how new generations find their way to wintering sites they have never seen, Oberhauser said.